When we moved into our house back in October 2011, my son’s bathroom had a border with a beach scene and some beach related decor over the toilet. My son wanted to keep with this theme, and in the meantime, my sister-in-law gave the kids some sea shells. 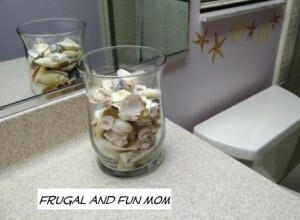 So, I went out and bought a glass vase from Walmart for $3 and put the sea shells in it, and I asked my son if he would like to paint an original water-color picture of a beach scene to decorate his bathroom as well. Of course my kids jump at any opportunity to paint, so I gave him a little direction of what I was looking for and he painted original artwork for his bathroom. In addition, I picked up a distressed looking picture frame from Michaels for $5.00 to place it in. I already had the supplies on hand, so for $5.00 I now have an original priceless piece of artwork hanging in my son’s bathroom. I also had him sign it as all artists do, and I put the date and his full name on the back of the picture. Of course he is extremely proud of this accomplishment and I think it is beautiful! 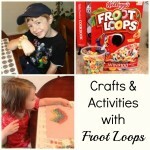 Have you done anything similar to this with your own children? I would love to hear your stories. 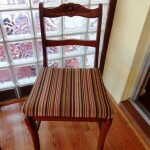 My 4 Chairs Got a Quick Makeover with Fabric And I Only Spent $9.00! 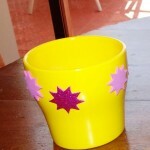 DIY Frugal Living Idea! Those are really cute ideas! Particularly like framing the pictures. Right now, I have two big bulletin boards that I peg their artwork, cards and souvenirs from our travels on. Then once every few months, I take them down and scrapbook most of it, then start again. We did this with my son's artwork when he was young. He was very talented. Still is. I did that with some of my daughter's artwork when she was younger. She finally decided it was "too young looking" and took it down. This is such a great idea. 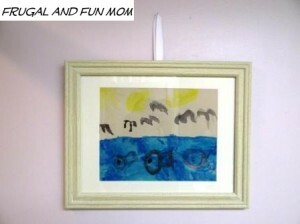 I have so much beautiful artwork that my boys have done that I would love to display for everyone to see!